Sitting nearly equidistant between the rugged slopes of the Cascade Mountains to the west and the stark beauty of the high desert to the east, the town of Burns has long served as a welcome respite for weary travelers crossing the state of Oregon. 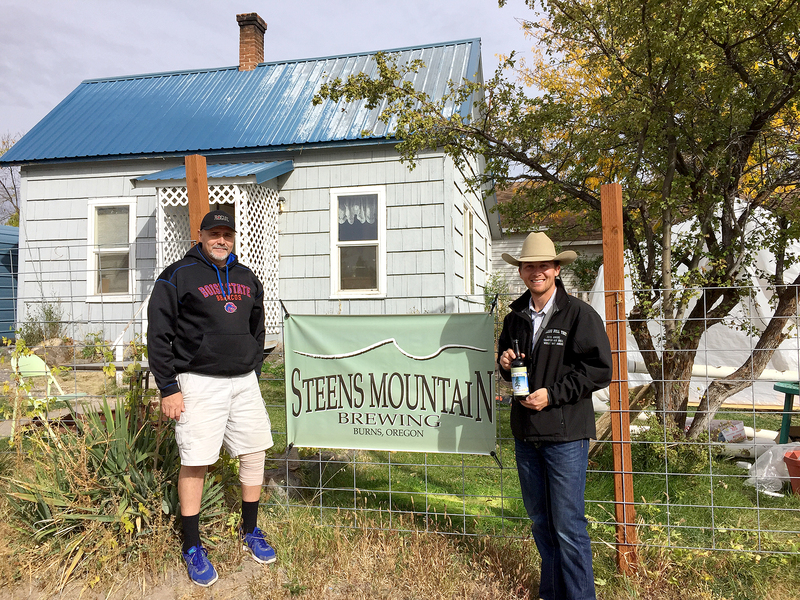 Rick Roy and his family opened the Steens Mountain Brewing Company to serve these travelers, and demonstrate the tremendous untapped potential of this rural community. Rick is a relative newcomer to the community of Burns, relocating to the area from his native New England to work for the Bureau of Land Management 12 years ago. However, he quickly came to feel at home in the area, as he became the inaugural lacrosse coach at the local high school soon after settling in Burns. In his work with the BLM, Rick often ran across patches of hops growing in the corners of center pivot irrigated fields or in the midst of long abandoned frontier homesteads. These feral hops – or heirloom hops as Rick prefers to call them – peaked his curiosity, and after witnessing the appetite for microbrew beer during a town festival, Rick decided it was time for Burns to have a brewery of its own. Rick procures almost of all of the hops used to brew from local sources, either from harvesting feral hops or cultivating hops in the yard beside the brewery, and stores them in a chest freezer. The brewery itself is a modest blue 2-bedroom home on a sleepy street a few blocks west of Main Street. In less than a year, Rick, his wife and 10 children, have managed to build a functioning brewery with a full product lineup, secure dedicated tap space at multiple restaurants, and build a loyal customer base. Rick has also given a tip of the cap to the Burns area by naming his beers after local landmarks or historical figures. The town’s namesake, poet Robert Burns, is name checked by the Burns Wee Heavy Scottish Ale, the original inhabitants are acknowledged by the Petroglyph Porter, and even the risqué named Whorehouse Meadows American Wheat draws naming inspiration from a local landmark. By working with his family and sourcing his materials from local producers, Rick has built the kind of family business rural America thrives on. If you ever find yourself driving along US 20 in Oregon, take the time to stop in Burns and visit Rick’s brewery; you’ll be glad you did. NWFU President Kent Wright greets Rick Roy in front of Steens Mountain Brewing Company.